Having a leaky washer can be quite troublesome as it makes the floor of your laundry room full of water. Leaking of a washing machine is quite a normal thing and there are many culprits for this. In most cases, old hoses are usually the main culprits but the problem could also be due to overusing of the machine or presence of a leaky pump. The good thing is that fixing a leaky washer is quite simple and in most cases, you can do the repair all by yourself. The most important thing is diagnosing the problem and then knowing what needs to be done in order to fix the problem. Unbalanced or overloaded washer: water can leak easily when the washer is loaded with a lot of clothes than it can afford to handle. In addition, leaking will also be present when the washer is loaded in such a way that the heavier clothes are all stacked on just one side. This causes an imbalance which shakes the washing machine when spinning. Interruption to the rinse cycle: For a rinse cycle having the spray rinse function, deciding to add some more time when it is spraying could lead to the spray going on for a longer time than it really should thus causing leakages. The drain plug: For brand new washers, the drain plug must be removed for the machine to work properly. If you fail to remove it for any reason, poor draining will definitely result in leakages. Check the drain horse: it is essential that you check and confirm that the drain hose has been secured properly in the drainpipe. Poor attachment of the hose may result in a leak. Still, clogging of the drain will also make your washer to start leaking as well. However, just because you are seeing a pool of water on the floor doesn’t mean that your washer is leaking. Sometimes, the whole issue could be a backed up drain and you will need to ensure that it is very clear just before you do the repairs. A leaking washer could be due to the problem of over-sudsing and this is something that you will need to address in your troubleshooting efforts. The problem usually results when the soap put in the washer tends to produce a lot of suds and this can lead to overflow problems thus leading to leaks. Actually, this issue is very common for households that use water softeners as the soap tends to easily sud. So if you are using a water softener, avoid using too much soap as this will only lead to leakages. To see where those water leaks could be coming from, run a cycle on your washer. Just try doing the laundry as you do normally to identify areas where your washing machine could be dripping. It should be easy for you to spot the area with the problem simply looking at the area where there is a pool of water. If you see the front part of the washer has a leakage, this could be due to the fact that the old seal is not fitted properly or the overflow tube is clogged. For leaks that are at the back side of the washing machine, this could be the result of damaged or loose supply hoses that need to be replaced. Leakages under the washer usually result from a leaky internal hoses or a hole in its water pump. Just in case you are yet to identify what is actually causing the leakage and your washer is old, replace or repair the hoses first and then fix other common culprits. Repeated use of the washer can lead to the clogging of the machine parts or they can lose elasticity thus resulting in leakages. Eventually, this will have to be replaced as they wear out and result in the leak. You don’t have to do all these repairs at once and you can start with the most common ones until the leakage finally stops. A leaky pump could also be the reason as to why your washer is leaking. The pump is responsible for moving the water to the drain from the washer tub. Internal seals make the pump and these can become worn out with time thus causing the leaks. As such, a pump can also stain due to rust or staining and in such a case; you have no option than to replace it right away. You just need to buy a new pump depending on the model of your washer and replace it by following the instructions detailed in your user’s manual. While it is possible to repair a leaky washer on your own, sometimes it makes sense that you hire an expert and let the problems repair your machine. Make sure that you hire a repair technician who is well qualified and experienced so that they can be able to spot the problem easily. This will save you from the troubles of trying to determine what the problem could be. 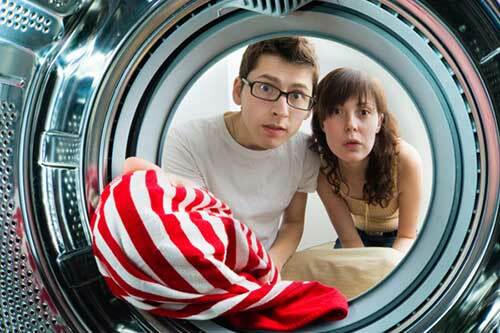 Calling D&V Appliance Repair you can be sure that you will have the same day, stress-free washer repair service. We will schedule your appointment at the most suitable time for you and will come fully equipped for the job. The majority of essential replacement parts are carried in our vans to be available for installation immediately. You don’t have to wait days for your appliance to get fixed. In fact, more that 70% of repair jobs we do are completed on the first visit. Our repairmen are properly certified, licensed and insured to provide you the best laundry appliances repair service in Orange County, CA. • Quality Repair. Our technicians are professionals; they are experienced and well-trained to do washing machine repair, they are also properly licensed, certified and fully insured. • Fast and Convenient Service. Most of the time we can come for repair the same day you call. We will give you small 3 hours appointment window, call you when we are on our way and won’t be late for appointment. • Free Estimate. Our diagnostic and estimate is free if you choose to do a repair with us. Before starting any repair job you will be given a written estimate for approval. • 5 Year Extended Part Warranty. We extend manufacturer’s warranty for 5 Years on any replacement part. • Stocked Vans. We load our vans as much as possible with the most common parts to be able to finish the repair right away in one trip. • Flat-Rate Pricing. The price for repair has simple breakdown: Labor + Part + Tax. It’s a flat fee, we never charge hourly for labor, we don’t add any extra charges for emergency, late hours or weekends jobs.